'Take a Knee and Bow Down to Guns': Latest Edition of HT's FREE App! In the latest edition of the News in Cartoons Humor Times app, called Take a Knee and Bow Down to Guns, the world’s greatest editorial cartoonists (who populate our popular Humor Times magazine with great material every single month) review the latest news in the way only political cartoonists can. Cartoon by Chris Britt, from the latest edition of HT’s free “News in Cartoons” app. Mr Britt’s work is also featured in the Humor Times monthly magazine, along with many other great editorial cartoonists. 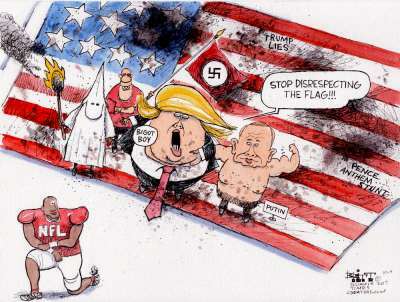 The so-called “president” continues to harangue NFL players for their “take a knee” protests during the national anthem to protest unrestrained police violence against blacks. He seems much more concerned with curtailing their nonthreatening free speech rights than taking on the very real threat of gun violence and the ever-increasing mass killings happening all across our nation. Yes, it is times like these that call for the talents of the world’s greatest political cartoonists, who help to give us perspective while taking unprincipled politicians down a few notches. The News in Cartoons app also features a “bonus cartoon” each issue, as well as a funny video of the week — this week’s short being a great one from comedian Jordan Klepper’s new show on Comedy Central that takes a page from Stephen Colbert’s old Colbert Report show, as Klepper plays the part of a right-wing media blowhard and hilariously exposes the hypocrisy of such talking heads in the process.